Okay, so what would no round-up story on artisanal Brooklyn food business seem complete without? YOU GOT IT IN ONE: Pickles, of course. 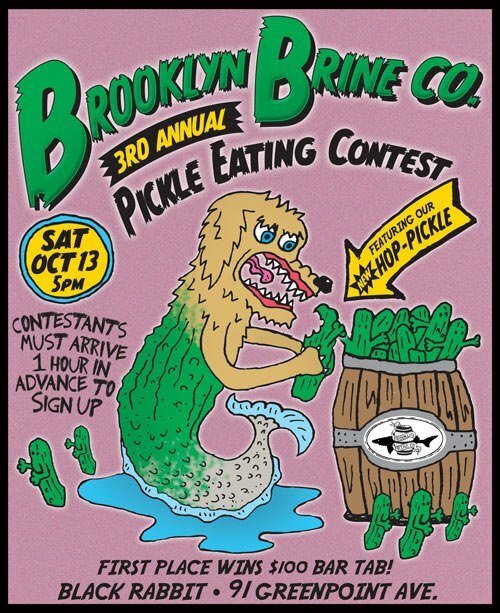 Brooklyn Brine has sponsored three pickle-eating contests annually in October. Usually we think of strawberries to go with our champagne, or if it’s to be something from the briny deep, then we think of caviar with our bubbly. Nonetheless, Brooklyn Artisan admits to finding the adorable happy-looking, dancing-tooting-and-toasting, puckered-up, party-hatted pickles waving their champagne flutes a lot more inviting to identify with than the soon-to-be-sick-as-a dog in the most recent annual-pickle-packing’s poster (click for a look). Just sayin’. « Plenty More Fish for the Borough, Tra-la!